Sam doesn't like the outdoors and would be happy if it all disappeared. But when he goes to stay with his grandmother he learns that the outdoors has an abundance of things to offer. 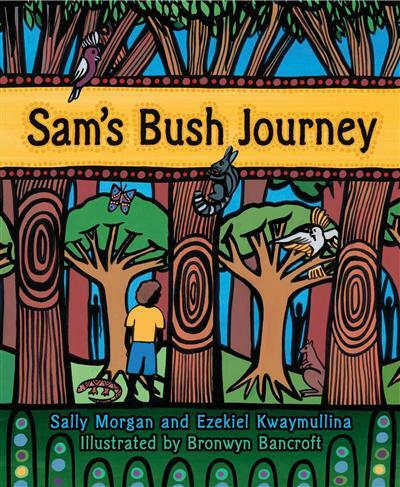 Sam's Bush Journey is brimming with themes that will promote discussion amongst young readers: journeys, the environment, storytelling, aboriginal knowledge of the bush and intergenerational knowledge. Sally Morgan and Ezekiel Kwaymullina are a mother-and-son team. They descend from the Palku people of the Pilbara, in the north-west of Western Australia. Sally is well known for her best-selling book My Place, which documents the journey of her family back to their people and country. 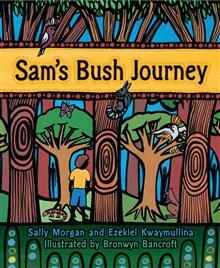 Sally Morgan is an Ambassador of Indigenous Literacy Day. Bronwyn Bancroft has illustrated several award-winning books for children. As well as being a children's illustrator, Bronwyn is a leading Australian artist. Her work is held at the National gallery of Australia, in state galleries and in the Australian Museum. Bronwyn is a descendant of the Bundjalung people.